Blue Roo (Christopher Larwood ) from South Australia reports on his 2018 FA Cup final odyssey. Travelling with my son Madhuka, he was already in awe of the whole London trip – experience – not a bad 18th birthday present, but the best was yet to come. A near perfect Spring day for two momentous events in the Capital. Fine, sunny weather saw pubs overflowing with people early on when the sideshow, AKA Royal Wedding took place and many didn’t leave as they settled in for the Main Event – FA Cup Final 2018. There were vastly more Chelsea everywhere I ventured – Earls Court, Central London, then Bakerloo line to Paddington for a stop at the Victoria pub. Over the many years of listening to the Chelsea FanCast, the FA Cup day ritual was often discussed. I’d visualised the scene in my mind & always longed to be in the thick of it with Chidge and the boys. Today was the day it actually happened. I did get to meet Royalty – that is, Chelsea Football Royalty at the Victoria pub – Dan Silver, Stuart Norman, Darren Mantle and Chidge himself presiding over a table of beers like a Lord. When I presented him with another full pint he said we’d have to race for it as he was just making a start on another. Not a wise thing to challenge a thirsty Australian to a beer race! There was a distinct buzz in the air with anticipation and excitement, the chances for a positive result chewed over – the Glorious unpredictability of Chelsea may well see a stunning win. Or not. It was time to move given the expected English queuing festival which was also a major football final so it was onto Wembley Central Station. Following the Londoners lead back to Paddington station, the plan then fell apart when the tourists got stuck needing more credit for the train service. A quick top up and bolting to platform was to no avail as the Fancast crew were out of sight and contact. The next train was only minutes away and took us to Wembley Central where we followed the crowd and emerged from the station to a concourse teaming with punters, majority carrying several cans of lager for the long 10 minute walk. Masses of stewards and security but no more than banter between fans outside stadium. The first glimpse of the stadium on our approach sent tingles down the spine – the size, a massive colosseum of football. Climbing the flights of internal stairs to our second level with anticipation building, opening the big doors to enter the arena itself with the breathtaking sight that unfolded as we emerged – a caldron of noise with music blaring, the pitch full of pre match activity, the stadium neatly divided into the most traditional of colours- Chelsea Blue in one half, ManU Red the other. Easily found our seats in Club Wembley 2nd tier which has a no club colours dress code so I was incognito – until Chelsea started singing. Seats near corner flag at the Chelsea end which was a real win as had no control over ticket allocation and could have been uncomfortable to be up close with the Red Mancs. The level of noise overall was massive from the stadium speakers plus both sets of fans. Couldn’t really tell from where we were how much Man U fans put out but Chelsea fans were loud and singing builds from the core up through the multi level stands to a deafening level. Fireworks and prematch were spectacular – the flame throwers are huge and could feel the heat even from our spot. After 22 years supporting from afar, I was about to watch Chelsea play live for the first time, in the FA Cup Final at Wembley against Manchester United – all thanks to winning an ESPN online competition that got me flights to London from South Australia, accommodation in Kensington and Club Wembley tickets to the match. I was feeling rather lucky – would this luck rub off? The match itself was tense and nerve shredding – Chelsea started well and after the Hazard penalty goal the response from ManU was predictably wave after wave of attack. Much of the possession was not threatening – all the same the ball being in the Red half made for nervous fans. I was really just waiting for the equaliser, the pressure kept building and minutes ticked by but Chelsea held firm and repelled the continuous attacks. Chelsea had a strong penalty claim denied later and I thought Pogba had scored when free on the penalty spot. The Sanchez offside goal drew a massive roar which quickly faded- we couldn’t tell it was being reviewed but the goal was not put on the scoreboard and no replays of any incidents were shown. 5 minutes of extra time was displayed by the 4th official and I checked my watch – if ManU don’t score, it would all be decided by 19:07 – And so the club formed in 1905, hung on until 19:07 on the 19 05 to win the match and lift the cup. After soaking up the victory celebrations from the players, staff and fans we reluctantly took a last long look at the scene, now deserted Man U end, the remainder of the Chelsea fans. There was no quick way for 87,000 people to leave an area so we were not in any hurry. It was time though to show my real identity and I quickly swapped my neutral dark blue for the very first Chelsea shirt I owned, Coors beer were the sponsor when I daringly asked a senior manager visiting London in 1996 to buy me a shirt from Lilywhites. Collected a couple of abandoned flags for souvenirs, left by Mancs wanting to erase the game and made our way out where thousands of Chelsea fans still milling around. Walking down Wembley way with the throng even more security and police. Some entrepreneurs had a very close replica of the FA Cup and were charging 5 pounds a photo- but it was a priceless photo opportunity so we joined the queue. I tossed a handful of coins into the capitalists paws and it was deemed enough. A few snaps and onwards we trudged – bit like a zombie walk at this stage of the early evening. Our only plan was to meet some Adelaide Chelsea mates at the Torch pub. We had no idea where it was but filed on with the happy Chelsea mob. With luck once again the 2nd pub we spotted shone out – it was the Torch and it was very fired up. A large outdoor area was packed with Chelsea fans with the Chelsea song book being sung with great enthusiasm. The singing leaders standing on tables to start each song. A scan across the crowd outside didn’t reveal any familiar faces so into the beer soaked interior we ventured. Our Friday night plan to meet the same people didn’t work out and it was 90 minutes since the game concluded so chances were slim they would have stayed. But the luck continued our way and I spotted an Adelaide Chelsea mate who I’d known since 1997. Hugs exchanged the beers recommenced and we joined in the singing, adding our own song- Adelaide Chelsea- we go where we want. A few curious nearby fans mingled with us and were amazed by my story of how I came to see Chelsea triumph. We didn’t leave the Torch until 10 pm or so. With the daylight stretching well beyond 9, its easy to lose track of time and we were having the time of our lives anyway! The streets back to Wembley Station were strewn with litter from the hordes of supports who had mostly found their way home or elsewhere to continue celebrations. Quite a long journey back to Green Park for the change to Piccadilly line and Earls Court Station. 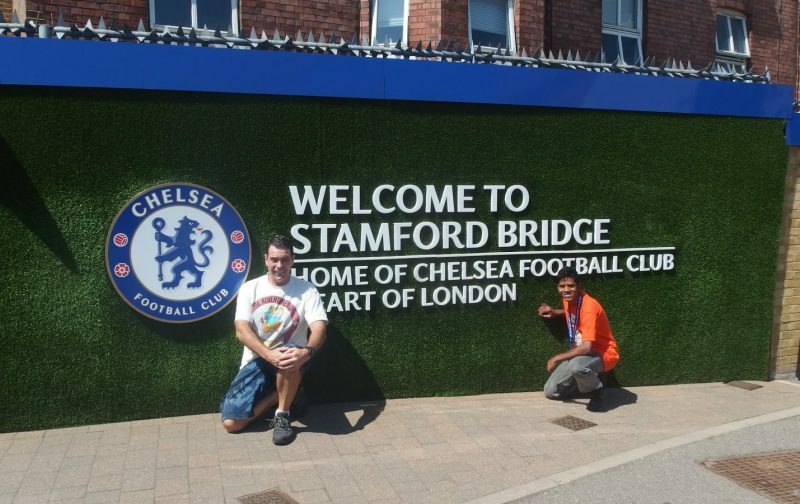 We bid our Adelaide Chelsea mates farewell and they had made the best possible part for 5 week visit to UK. Back into our hotel room it was only 11:30 Saturday night but the day already felt like a week. As I gathered my thoughts about such a remarkable day, my head was buzzing from enormity of the day, my ears were ringing from the roaring of the crowd, my throat was hoarse from singing, chanting, yelling, my eyes were watching the replay but still not believing I had witnessed this event in person, my heart was soaring that so many of my dreams came true on this day 19 May 2018.